Below, you'll find information that will help you get to know me better from awards and credentials We've achieved, to references from past clients. We consider the satisfaction of our clients to be our greatest achievement, and take pride in our high volume of repeat business and referrals. Call us today we'd love to add you to this growing list! 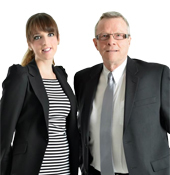 Lynn Shannon — 5 star- A shout out to the Robertson Team for taking me under their wing and recently selling my house. They were professional, knowledgable, reliable, efficient and kind. After 23 years in my home, which held many memories, they took the stress out of a stressful situation. With Phil and Melanie, you get the best of both worlds....one from the old school and one from the new! I won't say which is which! Phil sold my Mom's house a few years ago and it is nice to see that the Robertson legacy will carry on. Muriel Cameron — 5 star- I was happy to see that Phil had to teamed up with his daughter Melanie..the legacy will continue! At 80 years old it was a blessing to have Phil to guide me through the sale of my home. He did so with compassion, knowledge and humour. Thi is a great combination. Taron Cochrane — 5 star -This is what happens when kind, thoughtful people raise kind, thoughtful children ...they work together and give realtors a great name. A shining example of 'nice guys (and girls) finishing first' and a few of the people who continue to prove to me that realtors can be honest, trustworthy and reliable.